The 2018 NFL season is at the halfway point with some players and teams looking like forces to be reckoned with. Among them are strong MVP candidates such as running back Todd Gurley and quarterback Patrick Mahomes. Their respective teams, the Los Angeles Rams and Kansas City Chiefs, are both considered contenders in terms of reaching the Super Bowl. There are also several other players who have seen nice improvements since they started the season, and their Madden 19 player ratings have shown that. Adding to the fun of the video game, Madden is also handing out some midseason awards. Two players who are often shown at the top of MVP contenders lists are the Rams’ Todd Gurley and Chiefs’ Patrick Mahomes. Both of these players have had solid seasons for their teams and barring unfortunate injuries, that should continue. The Madden 19 midseason award for MVP goes to Gurley. A massive mid-season ratings update is HERE for #Madden19! He began the NFL season as an 85 in the Madden ratings but is now up as high as a 95. That’s not bad for a player who started as an 80 out of college. However, there are a few other players who should qualify for MVP before Gurley, including Patrick Mahomes. The Madden midseason awards named Mahomes as “Most Improved Player,” which is also true. With Mahomes, not many people predicted he would be this good in just his second season. The Kansas City quarterback has put up some stellar numbers. Mahomes leads all NFL QBs with 2,901 total yards passing. He’s also thrown 29 touchdowns and has a passer rating of 116.7 this season. He was recently listed as the odds-on-favorite at -140 to win NFL MVP, ahead of New Orleans Saints’ QB Drew Brees and Gurley. All of that has translated to a 90 overall rating in the game for Mahomes right now. Gurley and Mahomes are two big movers, but there are several others out there. San Diego Chargers quarterback Philip Rivers has gone up on his Madden player ratings by another two points. Rivers is now a 92 overall. That includes a plus-three to his Mobile Accuracy (MAC) recently. He’s got the Chargers looking like a playoff team at the midseason point. Adam Thielen is another player who has received a major boost. Thielen leads the NFL right now with 947 yards receiving and he’s hauled in seven touchdowns so far. The Minnesota Vikings wide receiver is up to a 94 overall after a two-point increase. That came after two-point increases to his CTH, CIT, and SPC numbers. Last month, he tallied a seventh-straight 100-yard receiving game too. 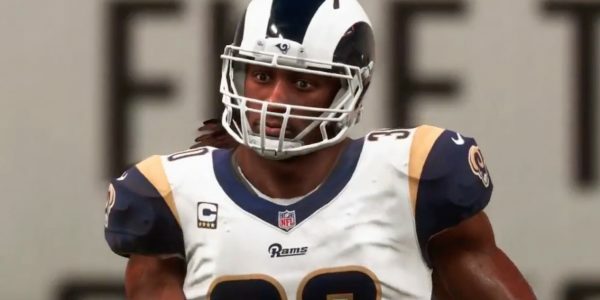 The Madden report via EA also mentions Rams quarterback Jared Goff, as well as the Panthers WR Christian McCaffrey, Chiefs halfback Kareem Hunt, and Steelers halfback James Conner. The latter of these players has filled in quite nicely for the Steelers this past season and has been among the top NFL running backs. Conner is currently an 82 overall in the Madden 19 game. Not everyone has had a brilliant NFL season, and their Madden 19 player ratings also reflect it. EA mentions that halfback David Johnson has not had the best of seasons for the Arizona Cardinals. He was once a 90 overall in the Madden game but has since fallen to an 88. Johnson used to be amongst the top backs in the league but is nearing the tail end of his Pro Bowl career. Other players who have experienced subpar seasons so far include Rams cornerback Marcus Peters, Broncos QB Case Keenum, Giants QB Eli Manning, and Cowboys running back Ezekiel Elliott. Manning has had a rough time of it as have Giants fans with just one win through the halfway point of the season. He’s currently a 74 overall, while Elliott has dropped recently by a point to a 90. See more of the numbers and explanations via EA Sports’ report. There’s still another half of a season to go, though, and these players above have time to turn it around. There’s also time for a new top contender for NFL MVP to emerge, so stay tuned! Also, check out more of the latest Madden 19 news here.